Loosen nut (1) and slide retaining bar (2) away from front panel (3). While holding connector (4), loosen compression nut (5). Pull temperature gauge (6) out of connector (4). 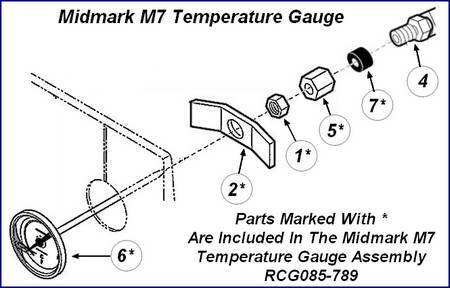 Install retaining bar (2), nut (1), compression nut (5), and Thermometer Sleeve (7) on temperature gauge (6). Making sure temperature gauge is oriented properly so face of gauge can be read by operator, position temperature gauge (6) on front panel (3) and secure with retaining bar (2) and nut (1). Slide thermometer sleeve (7) against connector (4). Install compression nut (5) on connector (4). Tighten compression nut until thermometer sleeve just starts to protrude out back side of compression nut. Do not tighten any further.